The smallest, and I think most would agree, among the cutest North American sea ducks, every autumn Buffleheads arrive on the shores of Cape Ann after having journeyed many thousands of miles from their summer breeding grounds in the Canadian boreal forests. They are seen in twos or in small groups and unlike most ducks, are monogamous. Some males begin courting very early in the season as demonstrated in the flock currently residing on Cape Ann however, the birds will not pair until spring. When out for a walk along shore and pond, you may notice a great deal of bufflehead kerfuffling taking place. The male’s courtship displays are wonderfully exuberant, with much head pumping, chest thrusting, and aggressive flying. The male goes so far as to exaggerate the size of his head by puffing out his bushy crest. Occasionally, the males chase females, but most of the chasing is directed towards other males in territorial displays, which are accomplished by both flying and skidding across the water as well as via underwater chasing. The female encourages her suitor vocally and with a less animated head pumping motion. Buffleheads are diving ducks, finding nourishment on Cape Ann on small sea creatures and pond grasses, as well as seed heads at the shoreline’s edge. By the early twentieth century Buffleheads were nearing extinction due to over hunting. Their numbers have increased although now their greatest threat is loss of habitat stemming from deforestation in the boreal forests and aspen parklands of Canada. The word bufflehead is a corruption of buffalo-head, called as such because of their disproportionately large and bulbous head. 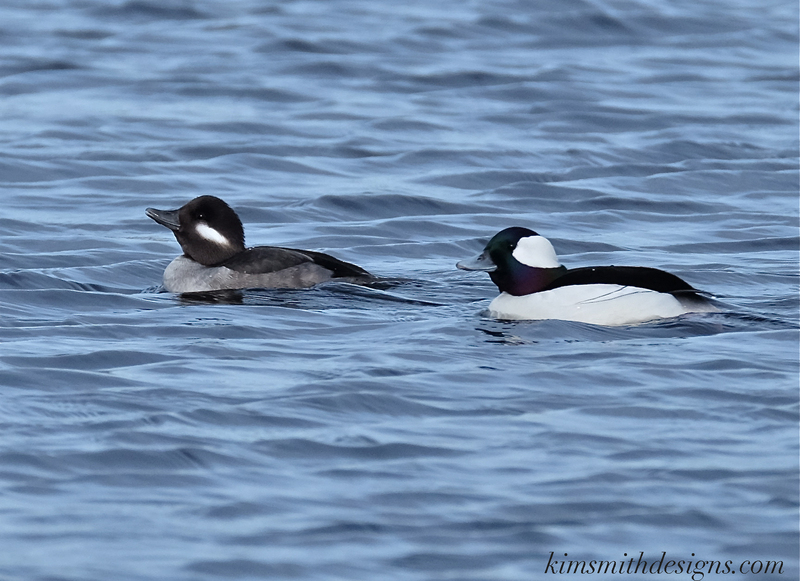 Buffleheads are a joy to watch and are seen all around Cape Ann throughout the fall, winter, and early spring. Their old-fashioned name, “Butterball,” aptly describes these handsome and welcome winter migrants! Listen for the Buffleheads mating vocalizations. The Bufflehead courtship scenes were filmed on Niles Pond. 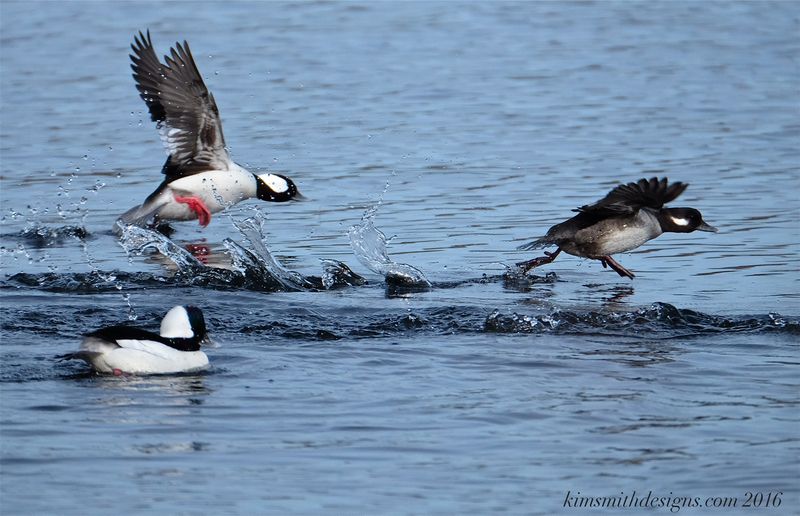 The end clip is of a flock of Buffleheads in flight and was shot at Pebble Beach, Rockport. This entry was posted in Birds, Birds of New England, Cape Ann, Gloucester and tagged birds of cape ann, birds of Massachusetts, Bucephela albeola, Bufflehead courtship, Bufflehead Kerfuffle, Bufflehead mating, Buffleheadfs, buffleheads, Butterball duck, Butterball ducks, Gloucester Harbor, Niles Pond, Pebble beach on March 3, 2016 by Kim Smith.